This beautiful Scandinavian Lodge in a sylvan setting high in the Wicklow hills is one of a small complex of lodges commanding breathtaking views of Glenmalure valley. 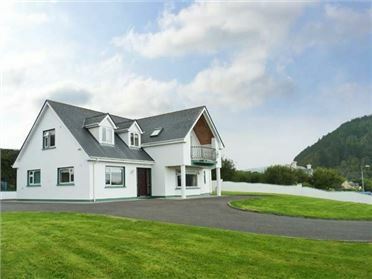 Adjacent to Glenmalure golf club, Glenmalure Pines is also located in the centre of the best hill-walking in the county, close to the Wicklow Way with Lugnaquilla, the highest peak in the region, nearby. Besides golf and hill walking and some of the most beautiful scenery in Ireland, there are also many other activities nearby: birdwatching, fishing, horse-riding, canoeing, and cycling to mention but a few. The premier beaches of the east coast are only 20 minutes away. The area abounds with many places of historical, aesthetic and natural interest. Wicklow is also famous for its many beautiful gardens, all within easy reach of the lodge. The 2 bed roomed Lodge is furnished to the highest quality and can accommodate 5 people. The master bedroom has a double and a single bed and the second bedroom has two single beds. Both bedrooms are en-suite.The large sitting room/dining room is a beautiful bright room in which to relax with a delightful wood burning stove, comfortable suite and dining area. A sliding door leads out to an extensive deck with furniture where you can enjoy meals outside, laze in the sun or watch the sun rise or set in the most tranquil surroundings. The compact kitchen leads off the dining area and is fully equipped. Off the main hallway is a small visitor's wc and a utility room. TV,DVD Radio/CD/Tapes books and places to visit inWicklow are provided. Rates include heating ,electricity, firewood, bed linen and towels.